Pogo has been part of some very exciting and groundbreaking industry changes over the course of its “lifetime.” When Pogo was founded in 1999, we helped pioneer access to Linux by offering dual-boot Windows and Linux desktops, as well as fully-supported Linux rackmount servers. Later, in the mid-2000s, we evangelized the adoption of SATA RAID storage on Linux to provide inexpensive bulk storage options, which didn’t exist before that. More recently, we adopted Software Defined Storage as a more cost-effective alternative to legacy proprietary storage solutions. In this vein, we continue to be on the forefront by announcing PogoStor, the first ZFS-on-Linux Software Defined Storage appliance. 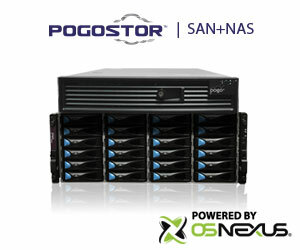 Powered by QuantaStor, from OS NEXUS, (www.osnexus.com), the PogoStor storage appliance is a breakthrough in Linux-based storage platforms. Not only does it bring ZFS, one of the best file systems ever built, to Linux, it also includes unique features — making it a flexible solution that can handle even the most challenging storage environments. ZFS was purpose-built with the features required for a robust, enterprise-grade storage appliance. The 128-bit file system has the potential to be so large that it would literally boil the oceans if maxed out! The copy-on-write architecture allows for unlimited snapshots and remote replication, with end-to-end checksums for superior data integrity. These features have typically been the weak link in traditional file systems, and give ZFS a powerful advantage when it comes to back-up, recovery, and overall data integrity. In-line compression saves space while increasing overall data throughput and uses little processor overhead. To top it all off, ZFS runs on open commodity hardware that significantly drives down deployment costs. If not for the events of March 2013: a native Linux kernel implementation of ZFS became available! This ZFS-on-Linux 0.6.2 build provided an open-source native Linux kernel module implementation of the Sun/Oracle ZFS and — finally! — a path to deploying ZFS on Linux. But who would be the first to commercially-integrate a ZoL solution??? QuantaStor v3.6 – A Single Platform to Store Them All! ZFS-on-Linux Integration – The launch of QuantaStor v3.6 with native support for ZFS-on-Linux (ZoL) added a number of advanced enterprise features like snapshots, compression, hybrid storage, and end-to-end checksums. The software-defined storage platform became a scale-out solution ideal for storage virtualization, cloud, and big data. In fact, with ZFS support for native SSD caching, QuantaStor can provide dedicated application performance, tunable by drive choices (SATA, SAS and Solid State) and ideal for boosting IOPs for high-throughput workloads. Enterprise-grade Cloud Storage – As a storage appliance, the addition of QuantaGrid™ technology, Gluster, and Citrix Essentials integration to existing multi-tenancy features will make storage volume provisioning and administration of third-party applications even more seamless and effortless than before for storage admins or IT managers with highly-transactional uses-cases like database cluster storage. Elegant Open Storage Management – One of the biggest knocks against most commercial Open Storage platforms (Heck, Open Source, period. ), has been the lack of a polished user-interface. 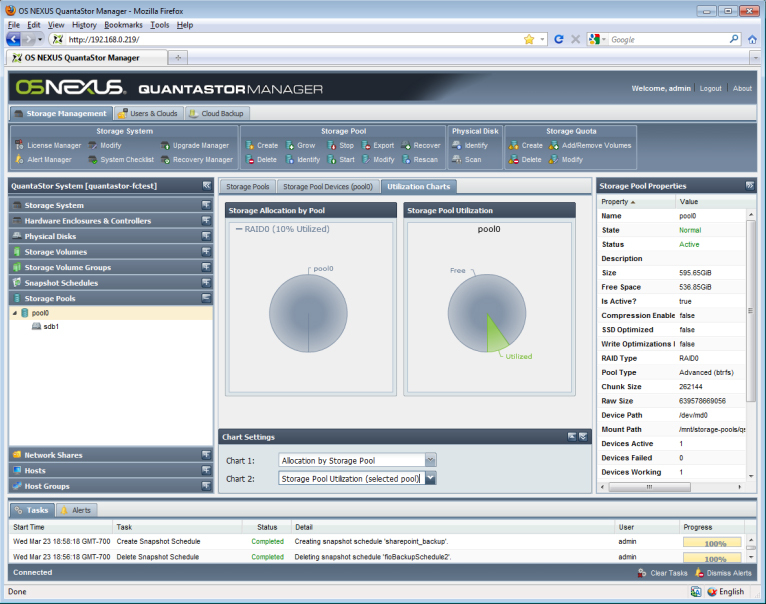 Never fear, the web-based QuantaStor Manager console is here! It shines with web 2.0 development, and provides the rich experiences you would get from a desktop application. The same holds true for multi-system management. You can log into any node in the grid and see the same grid-wide single pane of glass that is enabled by the QuantaGrid federated management technology. PogoStor combines the best open storage has to offer into a single package. ZFS on Linux? Check! QuantaStor Software Defined Storage? Check! Pogo Linux expert support and open hardware? Check and check! We are extremely excited about this product and the flexibility it brings to the storage market. Sometimes it takes a leap of faith to be first, but we’ve got our eyes on the future of open storage — and the future looks bright! To learn more about the PogoStor open storage platform visit the PogoStor product page. This entry was posted in Storage Solutions. Bookmark the permalink.